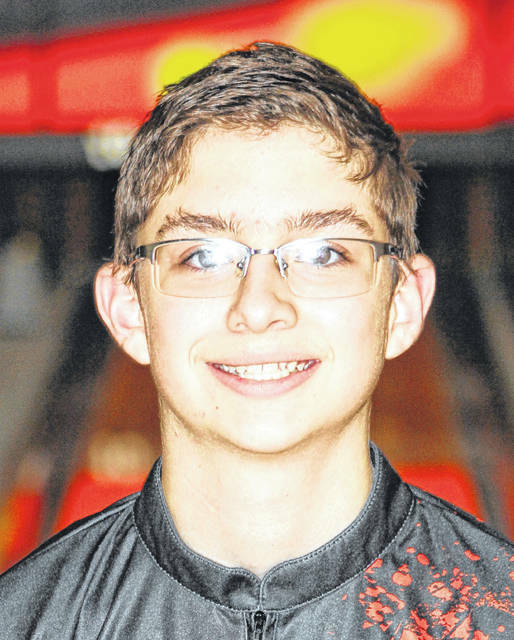 Jay Mumaw opened his first frame with a 9 and a spare in a match against New Bremen on Feb. 2 at McBo’s Lanes. He proceeded to strike the rest of the way out for a 290 game setting one school record. He went on to roll six more consecutive strikes in the second game and finished with a 233 to set a new school record for a two-game series at 523. Mumaw’s record-setting day coupled with the rest of the Versailles bowlers efforts led the Tigers to a win over New Bremen, 2803 to 2762. The first baker game consisted of Quayd Pearson, Seth Rinderle, Derek Morris, Mumaw and Landon Henry. Henry had a turkey, double and four bagger to roll a 243. Versailles rolled a 972 to New Bremen’s 863. The second game was made up of Tyler Gehret, Matthew Francis, Morris, Mumaw and Henry. Gehret had a double and a turkey to roll a 194. The Tigers rolled a 944 to the Cardinal’s 1027. The first baker game saw Gehret, Francis, Morris, Henry and Mumaw. With two open frames, the Tigers were able to roll a 178 to the Cardinals 191. The second baker game was made up of Pearson, Francis, Justin Heitkamp, Henry and Mumaw. Versailles rolled a 169 to New Bremen’s 177. The third baker game consisted of Pearson, Francis, Heitkamp, Henry and Mumaw. With one open frame, the Tigers rolled a 239 to the Cardinals 158. The fourth baker game was comprised of Pearson, Francis, Heitkamp, Mumaw and Henry. Versailles rolled a 171 to New Bremen’s 175. The fifth baker game saw Pearson, Francis, Heitkamp, Mumaw, Henry and Rinderle. The Tigers rolled a 130 to the Cardinals 171. The next time to catch your Tiger Bowling Team is Thursday, Feb. 7 at Coldwater to take on Parkway at 5 p.m.. The Tigers will also travel to Minster on Saturday, Feb. 9 for the Unofficial MAC Tournament beginning at 8 a.m. The Lady Tiger bowlers put on a show at their home match on Feb. 2 at McBo’s Lanes against the New Bremen Cardinals. The Tigers scored 2603 to the Cardinals 1865. The Tigers shot 843 to New Bremen’s 660 in Game 1. Senior Morgan Barlage led the girls with 208 followed by Lindsey Cheadle 207, senior Haddi Treon 151, senior Jena Mangen 150 and senior Morgan Heitkamp 127. The Tigers then shot 834 to New Bremen’s 661 in game 2. Leading the girls again was Barlage 195, Heitkamp 182, Treon 162, Mangen 158 and Cheadle/Kalysta Thobe 137. Heitkamp was able to find her mark better in game 2. Mangen and Treon did not put up their highest scores but they kept consistency throughout the match. The lineup for Baker games one and two were Treon, Natalie York, Thobe, Heitkamp and Barlage. Scores were 202 and 195. Barlage had a great last frame in baker game one striking out. The third baker game was bowled by Mangen, York, Thobe, Heitkamp and Barlage and the girls scored 192. Finally, in the last two baker games Thobe, Mangen, Treon, Heitkamp and Barlage scored 211 and 126. “We continue to improve in our baker series which is a very good thing in preparation for the tournament. We again got a season high baker score at this match,” said Coach Phlipot. A great crowd came out to watch the Senior girls at their last match at home. The girls ended up in second place overall in the conference. The girls will be back in action on Saturday, Feb. 9 in a conference tournament at Community Lanes in Minster and then the tournament begins. The Lady Tigers traveled to Speedway Lanes on Jan. 29 for a conference match against Parkway. The Tigers were hot to start with a first game score 875 to Parkway’s 562. Leading the Tigers were Morgan Barlage 202, Jena Mangen 195, Lindsey Cheadle 194, Haddi Treon 160 and Morgan Heitkamp 124. Rolling into game 2 the Tigers kept their focus and shot 929 to Parkway’s 588. The girls individual scores were Mangen 212, Treon 207, Heitkamp 178, Barlage 173 and Cheadle 159. “I challenged the girls to increase their consistency on their first shots and we set a team goal to shoot 900. The girls were able to accomplish their goals. We saw great consistency from Jena Mangen,” said Coach Phlipot. The five baker games were bowled by Kalysta Thobe, Natalie York, Treon, Barlage and Mangen. They bowled games of 216, 211, 181, 139, 170. “The girls all bowled well in the bakers and bowled a high series for bakers this year. It was great to see the team mesh well throughout the entire match. We again challenged the girls to take different roles,” said Coach Phlipot. The Tigers defeated Parkway 2721 to 1677. Team Orange was defeated by Minster Black (1738-1699) on Jan. 27 and also lost to Coldwater Black on Feb. 2 (1698-2008). Minster match: Colin Rismiller (68, 113), Ryan Pohl (106, 64), Colton Reese (79, 103), Blake Henry (125, 155), Brayden Henry (170, 163). Coldwater match: Colin (95, 87), Ryan (99), Colton (76), Joe Ruhenkamp (102, 148), Blake (135, 151), Brayden (180, 120). Team Record: 3-3.